Everyone knows the old adage: April showers bring May flowers. 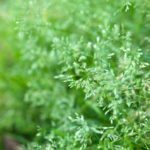 Unfortunately, many gardeners also learn that cool temperatures and spring rains followed by summer’s heat can bring fungal diseases. 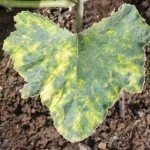 One such disease that thrives in the warmth of midsummer that follows wet spring weather is alternaria leaf spot on cucurbits. Cucurbits are plants in the gourd family. These include gourds, melons, squash, pumpkin, cucumber and many others. 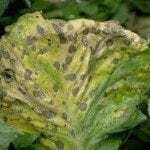 A fungal disease known as alternaria leaf spot, alternaria leaf blight or target leaf spot is known to affect several members of the cucurbit family, but is especially a problem on watermelon and cantaloupe plants. Leaf blight of cucurbits is caused by the fungal pathogen Alternaria cucumerina. This fungus can over winter in garden debris. 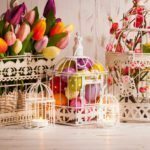 In spring, new plants can be infected by contact with infected garden surfaces and the splashing of rain or watering. As temperatures warm up in early to midsummer, temperatures become just right for mass spore growth. These spores are then carried on wind or rain to affect more plants, and the cycle continues. The first symptoms of cucurbit alternaria leaf spot is small 1-2 mm. light brown spots on the upper sides of older leaves on cucurbit plants. As the disease progresses, these spots grow in diameter and begin to display a ring or target-like pattern with lighter brown rings in the center and darker rings around them. Leaf blight of cucurbits mostly infects only the foliage, but in extreme cases it can affect the fruit causes dark, sunken lesions that may or may not be slightly fuzzy or downy. Infected leaves may curl or grow in a cupped shape. Eventually, infected foliage drops from the plant, which can cause the fruit to become damaged by wind, sunscald or ripen prematurely. Prevention is the best method for controlling leaf blight of cucurbits. Also, clean up garden debris in fall or spring, before planting new plants. It’s also recommended that cucurbit crops be rotated on a two year rotation, meaning after a garden site is used to grow cucurbits, cucurbits shouldn’t be planted in that same site for two years. Certain fungicides are effective in controlling cucurbit alternaria leaf spot. It is recommended to spray fungicides every 7-14 days to prevent and control the disease. Fungicides that contain the active ingredients azoxystrobin, boscalid, chlorothalonil, copper hydroxide, maneb, mancozeb, or potassium bicarbonate have shown effectiveness in preventing and treating leaf blight of cucurbits. Always read and follow fungicide labels, thoroughly.